“Photography is a way of feeling, of touching, of loving.” Ansel Adams. This is a visual world that we live in, and the choices people have for photographing their families, their business and their special events grow bigger by the day. Cameras are accessible, smaller, and more affordable. Phones produce great images, but a photographer trained in color management, composition and printing can be a wise investment for special family moments and events. What are the photos for? Are you building a website, selling your home or a car, highlighting a new business, celebrating a special occasion, or maybe you want to create an heirloom to mark a milestone birthday, or documenting a life well lived. Many great photographers are in business, but you should ask yourself some questions to help you choose the right fit for your needs. In the article “How to Choose Your Family Photographer,” the author points out that the best place to start when looking for a photographer is for referrals from friends. If they had a good experience, chances are you will too. However, just as friends might choose a different car, or school, from what you might choose, the same goes for a photographer. Do you want a photographer who specializes in a particular niche, or one that you can go to for all of your needs. In my experience, there are pros and cons on both sides of the choice. Personally, when I was setting up my business model for Faces-Places-Photography, I chose to be an “all purpose” photographer. I studied photography extensively, and I have never seen a genre of photography that I didn’t like, or, wasn’t intrigued by. I am a family photographer in every sense of the word. Teenagers change so much before they graduate from high school. Document yearly! It is important to look for a style of photography that will meet your needs. Look closely at the photographs on websites and social media. Resist the urge to text or email the prospective photographer. Take the time to make a phone call. It is a good time to ask questions, learn a little more about the photographer and start a plan for a photo session. The process of planning the photographs together is time well spent. Before booking an event as important as birth or wedding photography ask to see an entire gallery of work. Do they have the expertise to give you unique and beautiful work? Can they prepare photographs for prints and albums. What equipment do they have? Are they licensed, and are they paying insurance and taxes? What are the costs involved in the photo session? What is included, and when and how is the product delivered. Also ask if there are packages available to meet your needs. Sometimes photographers will offer a payment plan, take advantage of these options. At Faces-Places-Photography we are committed to creating the highest quality photographs in the New Braunfels, Texas and surrounding area market. We specialize in prints and products, but we are flexible and willing to provide digital images when needed. Call me to chat about choosing the best photographer for you! I can promise you that in photography you really do get what you pay for. Great quality comes with time, practice, and commitment to excellence. If a deal seems too good to be true, it probably is. In today’s fast moving society, where information flow to the public is often about what story is bigger, faster and easier to relate to, sometimes it pays to slow down. When I take portraits, and a session is finished, I like to stop and take photos of the small details of family interaction when the subjects don’t feel like they are “on stage,” or posing. Real moments are my very favorite. Portraits are wonderful and I love them, but a documentary photograph tugs at the heart. Photojournalism is the art or practice of communicating news by photographs. We are inundated by images of natural disasters, war, celebrities and so much more. Image files are processed quickly and are posted almost instantaneously posted on social media, in print or broadcast around the world more quickly every day. According to Kirsten Lewis, “Documentary photography is really and an art, it is a type of photojournalism where the photographer is aiming to create a series of pictures that will a complete story.” This is Documentary Family Photojournalism. Last year I took a class online through Click Photo School, The Documentary Approach, and started following one of the other students, Francesca Russell, who is a photographer and filmmaker in New York City. Last month Francesca started a project that asks the question, “What is your legacy?” In the first week the prompts encourage the participant to look back on their birth story, and how their parents met. In doing that, and talking with my mom about my story, I found a new perspective to approach family photography. My goal has always been to produce unique, and personal images for my clients. The photographs are more than the digital negative. They are memories for a lifetime. My mother, Miriam Gentry, with me in 1958. This photo of me taken soon after I was born is very special to me. It highlights the beginning of the relationship between mother and daughter and the connection between us even in those early months is obvious as you can see in the picture. It is very precious to me as a daughter, a mother and a grandmother. It is one of the many that tell the story of my life, and the journey through that life with my mother. It is important to look back, as well as looking forward. Families with new babies, people on vacation, seniors in high school, and engaged couples all deserve to have their story told in photos. Please contact me to hear all about my documentary photography sessions. Back to school photos are traditional and enduring. As a photographer, as well as a mother and grandmother, nothing makes me happier than to document the special moments of a child's life. These photos will be like a road map of their childhood. Take the time to document the school and year that lies ahead for the child in a set of photos. These photos are so much more than just a snapshot of your child with the sign showing his or her grade in front of your home, or the school on the first day. They are a visual history. In reality the photos can be taken on the first day of school; or they can be a set of documentary photos that show the true personality of your child for a period of time. Childhood is fleeting and as we look back on the past seeing the transition from youngster to adult is a true gift. It's a good idea to make sure to get a full length photograph. In her article for The Washington Post, Jamie Davis Smith, a documentary photographer writes that she "tried to think broadly and capture all of the steps involved in going back to school, as well as how my children are feeling about the transition." Get close and show the beautiful details of the your child's face. Remember to think about your family and the traditions that are important to you, as well as your children. some children are excited about the first day of school outfit, while others are more excited to see friends that they haven't seen in many months. Sometimes the first day of school is not always happily anticipated. sometimes school can be scary, or even dreaded. Be sure to document the good, bad and the ugly, as real life moments are especially treasured memories. What!! You haven't had pictures taken to celebrate the first day of school! Make plans. Contact Marcia Richardson about documenting your life in photographs. Make memories for a lifetime! I always print my photographs. I have compiled scrapbooks, edited my high school yearbook and graced my home with family photos that have become family treasures. As we move further into the digital age photographs fill our computer hard drives, as well as our phones and tablets. These digital files are in many ways more fragile than prints. They must be copied and stored in different locations to protect their viability with redundancy. We aren't sure about the long term future of digital image files. they aren't a sure thing forever. Technology changes so quickly that the mediums that we view these files on can become obsolete. When was the last time you viewed a VCR tape? VCR technology was brand new when I was married in 1980, and that was just 37 years ago. Yet VCRs are ancient history in the technology world. It’s important to find the time and resources to print. For the consumer printing makes sense for many reasons. You have the ability to preserve priceless family moments for a lifetime. My grandchildren's photos grace my bedroom wall. My father and his parents. I scanned the original photo and printed this heirloom photograph. I believe that it is important to approach a client’s unique photography needs individually. I look at photography differently from a chain studio that provides a service that will document your child at different stages of their lives based on current trends on Pinterest and Instagram. Certainly there is a place for these kinds of photographs. The more the merrier. However, I want to capture the essence of who your child is at a certain age. This is a different approach and can certainly be considered an investment. I will always ask my clients whither they are looking for fine art for their walls, a photo album or book, or digital files. These choices all require a session that may require different lenses and certainly require different types of editing. My gear is professional and can cover all of your photography needs. I chronicled my 72 hour trip though some of my favorite destinations as well as new ones. Travel and landscape photography is a fascinating discipline. There is no better souvenir to bring home from a trip abroad than a photograph. Over the last three years I have been documenting my new home. I live in the Texas hill country. As I prepare for the official launch of Faces-Places-Photography on July 1, 2017 I have been printing many of these wonderful photographs as big prints. Each time I look at these wonderful pieces of art I am reminded of how lucky I am to live in this wonderful region of the country. If you would like to discuss making prints for your family please contact me. Ask yourself; when is the last time you put a new photograph on the wall or in the pages of a memory book. Plan to print. Memorial Day has a special meaning to me. I am a military kid, the spouse of a career Soldier, and the mom to an active duty Infantry Soldier and that brings my total years affiliated with the United States Military to fifty nine years of service. Service as a family member of the great men in my life, but service nonetheless. When I think of our friends and family who have given their lives in the ultimate sacrifice to this nation I am humbled by the magnitude of the love that I have for them and for their service. These experiences have formed my identity. Why is Memorial Day important to photography? First, it is the photos that we have from our past that will bring back the memories of those important people in our lives that are no longer with us. Future generations will witness a testament to both family and country through the memories that are recorded print. Pictures as they say, are worth a thousand words. Second, what would we do if we did not have the freedom of expression that we hold so dear to our hearts as photographers. In some cultures and countries people are censored and arrested for taking a photo. Today often times photographers are treated suspiciously. We as Americans take the simple freedom of taking a photo for granted. Images can be so powerful in swaying emotion: just think about the images of concentration camps in WWII, the nuclear bomb devastation in Japan, or the immolation of the young girl by napalm in Vietnam. All of those images are possible by virtue of our freedom of expression, honored in the United States, that other countries would not have allowed. This is a day when we leave politics at the door and take time to think about what it means to live in the greatest country in the world and to have the freedom of expression. But, freedom for us has come at a steep price. Take out your photos of loved ones and friends and share them with others. Also take the time to make new memories. Take out your camera, or your phone and take photos to remember these times, good and bad, for the memories of future generations. If you need an event photographer to capture family reunions or military deployments please think of Faces-Places-Photography for these special occasions. The Texas Hill Country presents wonderful opportunities for day trips from the San Antonio and Austin. I find myself hitting my brakes; locating a safe place to pull over; and jumping out of my car to make a photograph. It is always the same whether it is a derelict peach stand, a funny sign-post, a poignant notice, or a breathtaking vista: I must have repeated this event a thousand times. 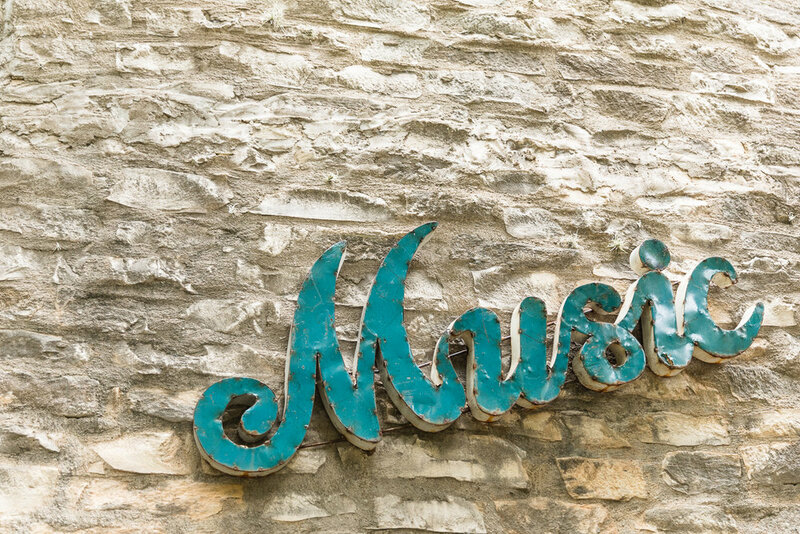 This month as my husband and I celebrated our thirty- seventh wedding anniversary we made the trip from our home in New Braunfels, Texas to the vibrant small town of Wimberley. It’s just twenty-five miles from our home and we enjoy all of the amenities that Wimberley has to offer. In 2015 Wimberley suffered a blow when Cypress Creek and the Blanco River flooded in May and then in October of that year. The city has adopted the “Wimberley Strong” banner and the city is rebounding in true Texas fashion. This article from USA Today highlights the spirit of the town and the people that choose to live here. Hiking along Cypress Creek in Wimberley, Texas. The area is recovering from floods. Celebrating 37 years of marriage to my husband Tom Richardson. Serenity Farmhouse Inn, Bed and Breakfast and Wedding Venue is tucked away in a lovely wooded area about eight miles outside of Wimberley. We were greeted warmly by the proprietor of the inn and treated to wine and chocolate as we settled in to our bungalow. In the morning our breakfast was delivered to us and it was delicious! We were off to hike the Cypress Creek Nature Trail by mid morning. On our way out to the trail we stopped in Annie James Boutique and I found a great outfit for my portfolio show next month. What a great selection. Our hike was fun. It is great to see the area being protected and given the chance to rebound from the flood damage. After our hike we had a snack and made a trip out to Duchman Family Winery for a glass of wine. We had a great visit with the sommelier, and ended up signing up for their wine club! Please take a moment to check out my travel and landscape photography in my Places portfolio and contact me if you are interested in my Hill Country Places Workshops that will commence in the spring of 2018. The key to success is patience. When taking photos of young children, and their families, more often than not the best photographs happen when you least expect them. I often find that at the beginning of a photo session that everyone is a little bit nervous and stiff. This is understandable because in most cases everyone has just met. It is worthwhile to spend just a few minutes getting to know one another and develop a rapport with the family. This article was very helpful to me. It lists the many ways that you can make the experience better for both clients and the photographer. The more relaxed that everyone is the better the session will go. When you have a two year old involved in the session expectations must be adjusted. Bubbles are a great prop! Unless the two year old feels like she needs to hold the bubbles! After a small break we put the bubbles out of sight and we had happy smiles!! If you find that one member of the family is struggling, give them a break. Sometimes they just need to catch their breath and have a drink of water or a small snack. I always have an assistant when I am taking photos of young children. The assistant can handle snack and break time. In the meantime I keep shooting. Often I find that I capture my favorite photos from a photo session when I least expect it. What a wonderful bond between brothers! These are special relationships. It is critical to be prepared for a photo shoot. 3) Have water and a snack. As a photographer you can never be TOO well prepared. Research and practice is critical and almost always pays big dividends. This article is a great reminder of what a professional photographer must prepare for in the lead-time before a portrait session. Family photographs are priceless memories for a lifetime. Catch those wonderful moments at the end of the session. Don’t throw away the outtakes of these types of sessions. Often parents will find the outtakes very special. Many times I love the “failed” photographs just as appealing as the posed and formal photos. I love both classical and documentary photography and try to capture a mix of both in my portrait work. Take a minute to learn about my background. Please contact me to plan your next portrait session. I will be prepared! Mother’s Day is just one week away and this is a great time to start thinking about making photographs that will highlight the special relationship between mothers and their children. In 2017, there are cameras everywhere. The cell phone camera has changed the way that people think about photographs. Spontaneous moments snapped on the phone are fun. Who doesn’t love the occasional selfie? However, life captured intentionally with professional photographs that will grace your home in the form of fine art prints and heirloom albums make for the ultimate Mother’s Day gift. Generational photography is a beautiful way to commemorate Mother's Day. A generational photo of the women in your family is going to be a treasure for the ages. There are many ways to approach this type of photograph. You can take a more classic and traditional studio photo that will be a family heirloom, or grab a fun candid that shows all kinds of personality and will also stand the test of time for family generations to come. Pinterest is a great source of information and ideas making the best choice of photography session for your family. An unplanned mother and daughter moment captured by Faces-Places portrait photography. Be flexible and creative when you consider the kind of photos you want to capture of mothers and children. Some of my favorite photographs are the unexpected moments between mother and child. You can photograph these moments in a formal setting, however a documentary photograph that catches a special relationship is both meaningful and heartwarming. Explore the faces portfolio on my website to see the different ways to approach a portrait. New Braunfels Documentary Portrait Photographer | Mom's everyday life.